Soak the chickpeas in 6 cups of water for 5 hrs . Drain the water and keep aside. Add the chickpeas to a cooker and add enough water to cover the chickpeas. Pressure cook them till they are tender. Alternately, you can use tinned chickpeas instead of dried ones. Roast the Sesame seeds for about a minute and grind it into a powder. Combine chickpeas, garlic, lemon juice, olive oil, and sesame paste in a food processor and blend until ingredients come together into a thick paste. With the food processor running, add a little water, about half a tablespoon at a time, until the hummus becomes smooth and creamy. Add salt and pepper, to taste. Transfer creamy hummus into a bowl . Drizzle with extra-virgin olive oil just before serving and sprinkle with paprika. Hummus can be served with Vegetable sticks / Pita Bread / Falafel (chickpeas fritters). 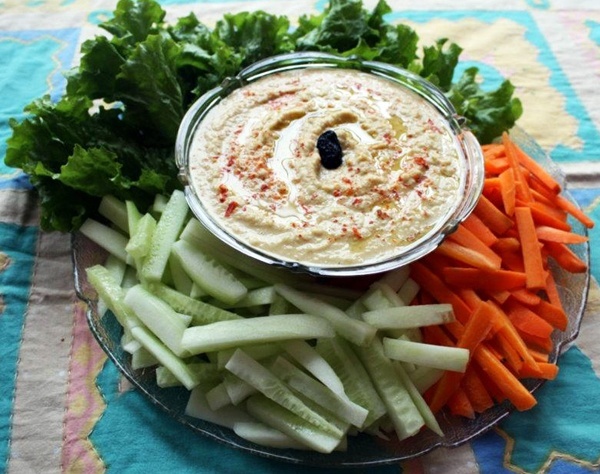 This entry was posted in Pulses & Beans, Snacks & Appetizers and tagged Chickpea, hummus, Quick Food by Kamakshi. Bookmark the permalink.